Self tying wires that wrap around themselves and stay. Soft and flexible, hands stay clean and cut free. Applications: Ideal for hobbies, fixing up fences and hanging heavy equipment. Self tying wires that wrap around themselves and stay. Soft and flexible, hands stay clean and cut free. Applications: Ideal for hobbies, fixing up fences and hanging heavy equipment. Self tying wires that wrap around themselves and stay. Soft and flexible, hands stay clean and cut free. Ideal for hobbies, fixing up fences and hanging heavy equipment. 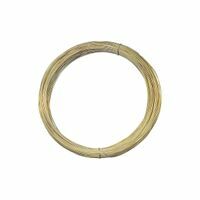 National Hardware Wire, Series: V2568, 28 ga Wire, 100 ft Length, Steel, Galvanized, BHMA A138.18, 4 lb Load, For Crafts, Art Projects and Various Home Projects Self tying wires that wrap around themselves and stay. Soft and flexible, hands stay clean and cut free. Applications: Ideal for hobbies, fixing up fences and hanging heavy equipment. Self tying wires that wrap around themselves and stay. Soft and flexible, hands stay clean and cut free. Applications: Ideal for hobbies, fixing up fences and hanging heavy equipment. This soft wire is coated with rust inhibitor. Self tying wires that wrap around themselves and stay. Soft and flexible, hands stay clean and cut free. Ideal for hobbies, fixing up fences and hanging heavy equipment. This soft wire is coated with rust inhibitor. This soft wire is coated with rust inhibitor. Self tying wires that wrap around themselves and stay. Soft and flexible, hands stay clean and cut free. Applications: Ideal for hobbies, fixing up fences and hanging heavy equipment. Plastic coated floral wire, 24 gauge. Hobby wire for home, school and workplace. Wire that is great for home, hobbies, school and workplace. Self tying wires that wrap around themselves and stay. Soft and flexible, hands stay clean and cut free. Ideal for hobbies, fixing up fences and hanging heavy equipment. Self tying wires that wrap around themselves and stay. Soft and flexible, hands stay clean and cut free. Ideal for hobbies, fixing up fences and hanging heavy equipment. Self tying wire wraps in soft plastic coating around itself and stays. Finger Friendly strands. Hands stay clean and cut-free. Kink resistant. Self tying wires that wrap around themselves and stay. Soft and flexible, hands stay clean and cut free. Applications: Ideal for hobbies, fixing up fences and hanging heavy equipment. Self tying wires that wrap around themselves and stay. Soft and flexible, hands stay clean and cut free. Applications: Ideal for hobbies, fixing up fences and hanging heavy equipment. Self tying wires that wrap around themselves and stay. Soft and flexible, hands stay clean and cut free. Ideal for hobbies, fixing up fences and hanging heavy equipment. Self tying wires that wrap around themselves and stay. Soft and flexible, hands stay clean and cut free. Applications: Ideal for hobbies, fixing up fences and hanging heavy equipment. Wire that is great for home, hobbies, school and workplace. Self tying wires that wrap around themselves and stay. Soft and flexible, hands stay clean and cut free. Applications: Ideal for hobbies, fixing up fences and hanging heavy equipment. Wire that is great for home, hobbies, school and workplace. Wire that is great for home, hobbies, school and workplace. Self tying wires that wrap around themselves and stay. Soft and flexible, hands stay clean and cut free. Applications: Ideal for hobbies, fixing up fences and hanging heavy equipment. Self tying wires that wrap around themselves and stay. Soft and flexible, hands stay clean and cut free. Applications: Ideal for hobbies, fixing up fences and hanging heavy equipment.